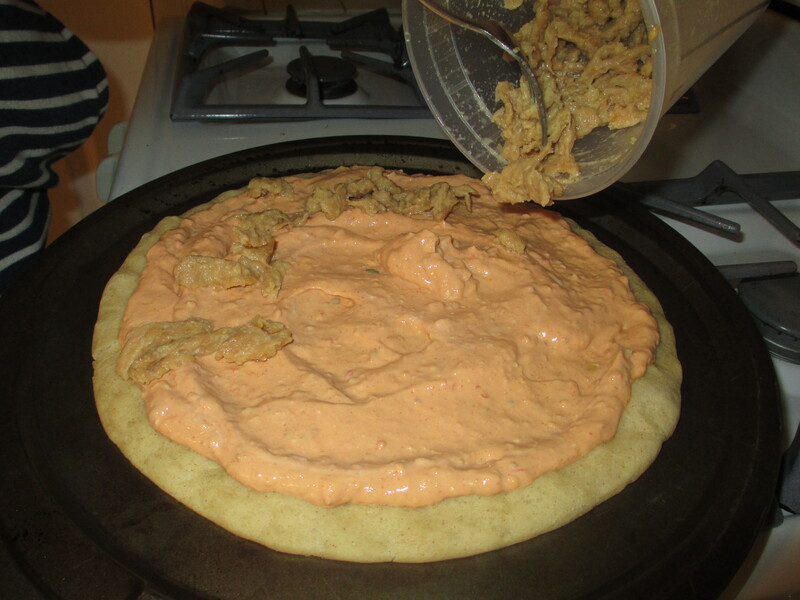 This was our first in a line of experiments involving some of our favorite ingredients: PB2, Sriracha and tofu. We wanted pizza but didn’t have any of he traditional ingredients so we decided to wing it and make something Thai-inspired. 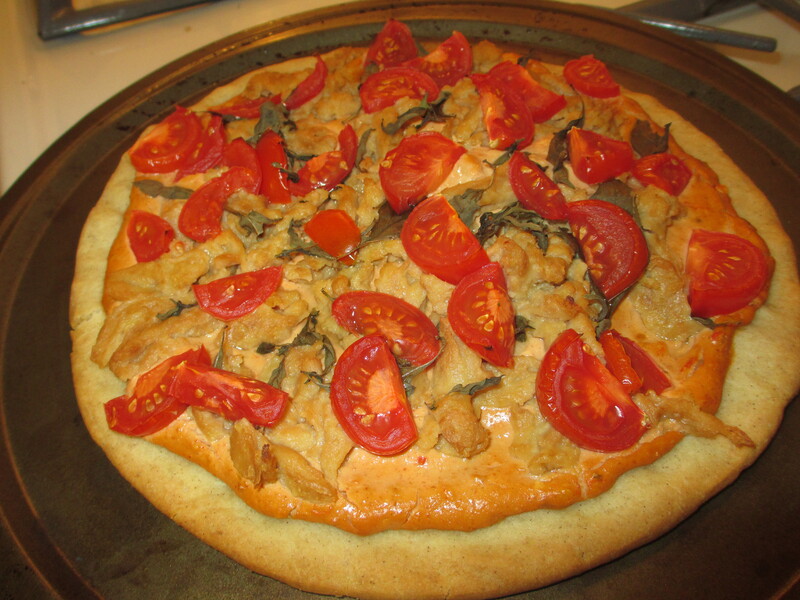 We used a pre-made gluten-free pizza crust from the ZenCat bakery but you can use a storebought variety or make our home-made crust. I blended it until it looked smooth while Brent prepared some soy curls. We topped it with some sliced tomato and Thai basil (cilantro would work well too) and then baked it until it had started to brown around the edges. 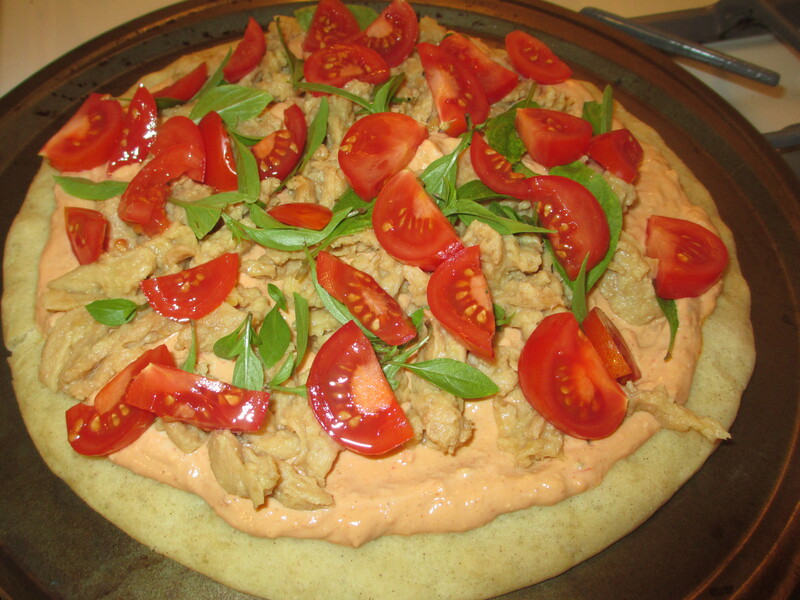 A sprinkling of chopped peanuts (or cashews) really made this pizza interesting but it won’t suffer if you leave it off. It was creamy, spicy and decadent. It felt a lot naughtier than it was in terms of nutrition. The next time we do this, I’ll probably add some fresh cilantro or Thai basil after baking. I just love the cinnamon flavors it adds. This post is about making stock for soup, mashed potatoes, French Onion soup, gravy, risotto or whatever you would normally use soup stock for and it’s crazy simple. Even if you like to compost (or have bunnies to ‘process’ your leftover veggies) this is a great way to get more out of your veggies before you throw them in your bin. Get yourself a big old freezer safe storage container. Every time you peel the skins off onions or garlic, cut the ends of carrots or celery, stems from parsley and other herbs, stumps from mushrooms or broccoli… really anything. I add lemon peel from time to time for certain recipes like pho and orange peel for zesty soy curls. Dump it into the container (I like to use a freezer bag) and store in your freezer. When your container is full of veggie scraps, dump the contents into a pan, cover with water and simmer for at least 2 hours. Strain the liquid into a container and freeze for whenever. 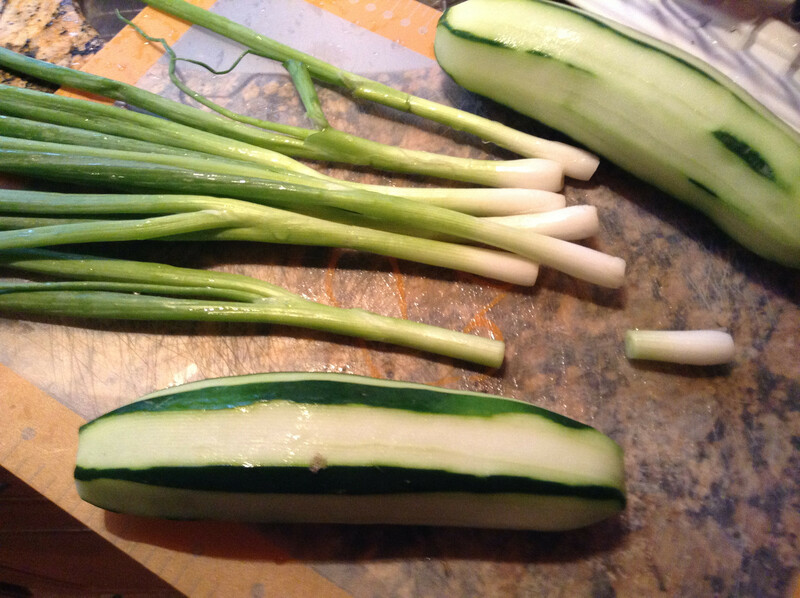 Now the veggies are extra mushy for composting or your sink disposal. The stock will have no added fat or sodium and full of flavor. I like to store the stock in zippered freezer baggies too. If the bag is full enough for about 1/2 inch thickness when lying on its side, then you’ll be able to thaw it quickly. 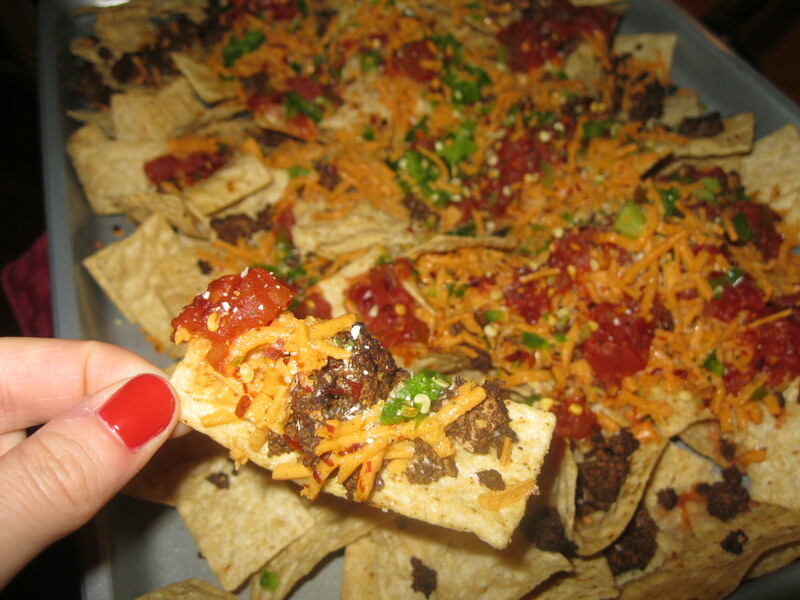 The Lazy Vegan: Amy’s Strikes Again, Another Giveaway Winner! Now I know that making chili is really easy but I’m glad to know that there’s a vegan option out there for when I don’t have time or simply don’t want to make a giant pot of chili. 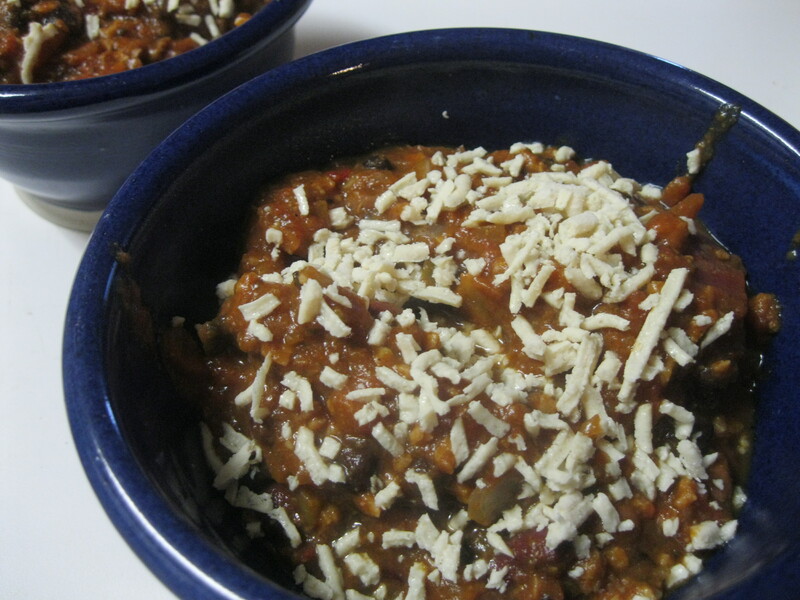 Amy’s Organic Chili is a great vegan chili that consists of red beans and tofu (textured to look like ground meat). I tried the Medium spice level which wasn’t terribly spicy at all — it’s more tart/salty than spicy. The directions are simple. Maybe a little too simple: heat and serve. Um… how about a little guidance, Amy? I definitely didn’t want to have to wash a pot to I poured half the can into a microwave-safe bowl, heated it for 60 sec, mixed it around and then heated it for another 45 seconds. This seemed like a perfect amount of time. Warning: it will explode so make sure you cover the bowl before heating it. The chili tasted good, but there’s a weird sweetness to it and I found that it improved exponentially after I added some raw onion and crushed red pepper. Cheese, such as shredded Daiya cheddar, would probably be a good addition as well. I found the beans to be a little mushy. 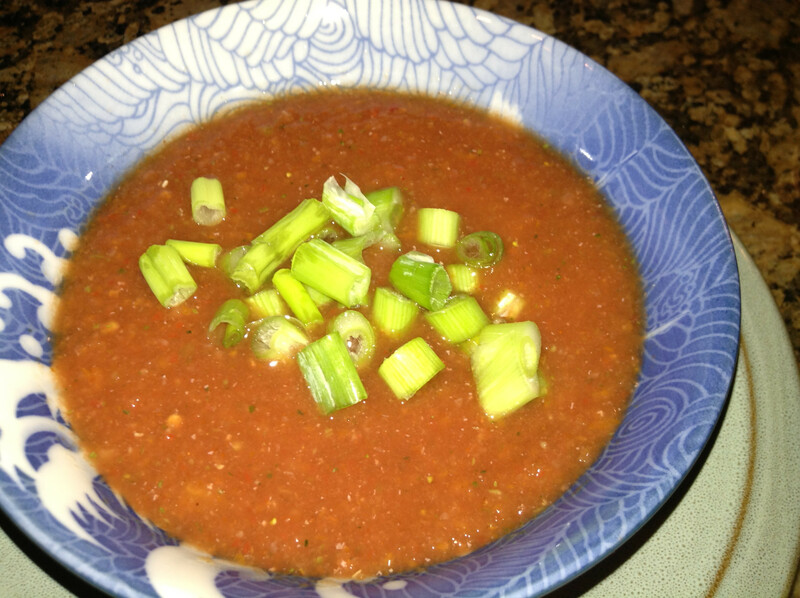 It doesn’t compare to homemade chili, but I would definitely buy it again to keep in the cupboard when I’m looking for something comforting and easy on a cold winter night. 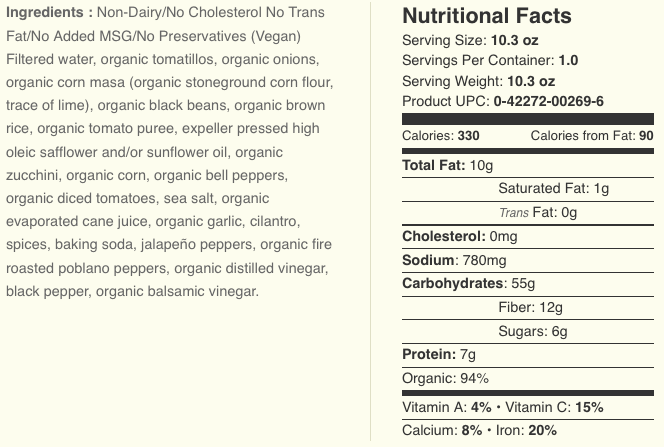 I also think that this would work great on nachos or maybe even on fries or a vegan hot dog. At any rate, I am a big fan of Amy’s and have been so long before I turned veganese. I’m really happy to see more Amy’s products, including gluten- and dairy-free products, in my grocer’s freezer and canned food aisle. 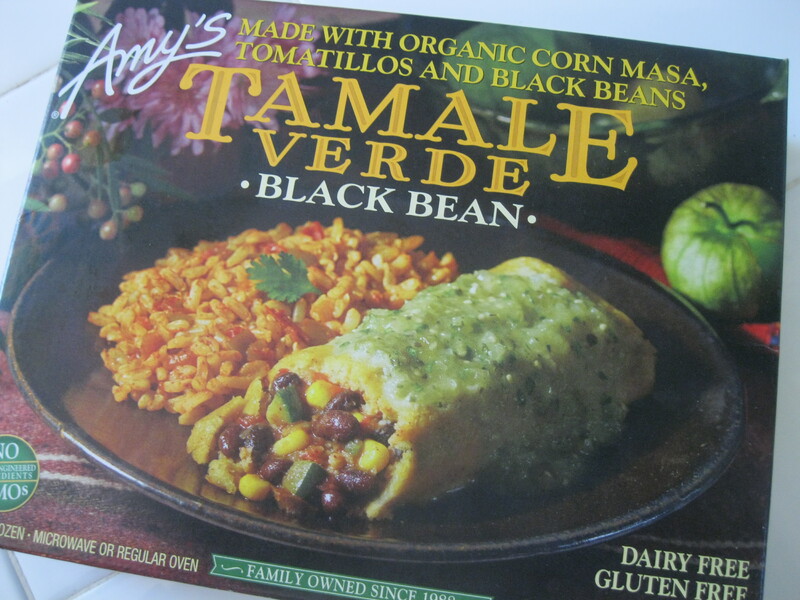 We’ve been giving Amy’s frozen dinners a try lately after a recent success with tamale with roasted vegetables so we went ahead and decided to try their tamale with salsa verde. It looked a lot more appetizing right out of the box. 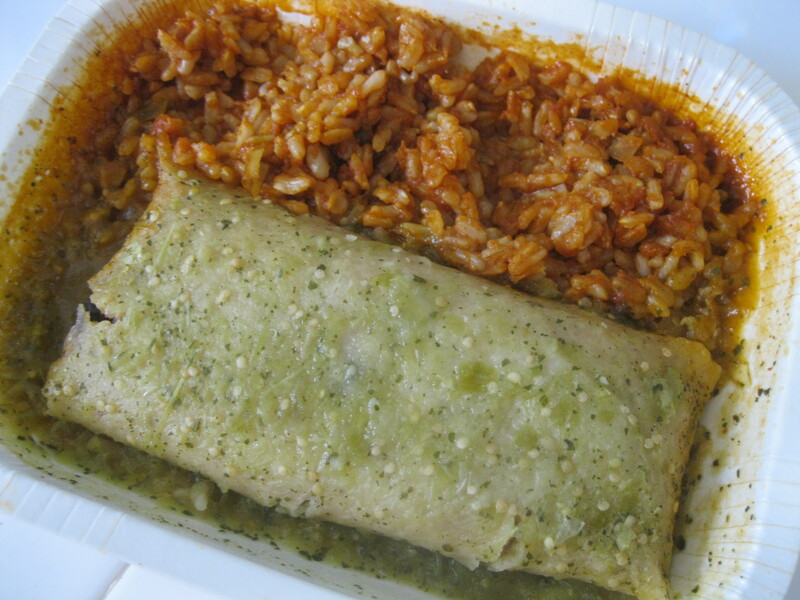 This is because the rice is recognizable compared with the puddle of beans in the other package. We prepared this in our microwave and it was quick and easy to follow the instructions. We ended up adding some flake red pepper and garlic salt but that’s just how we roll. The ingredients were unobjectionable and it was tasty all by itself. The ingredients were good and it was reasonably priced for how much time and cleanup it saved me. I think I need to learn how to make my own tamales, but I’d buy it again. 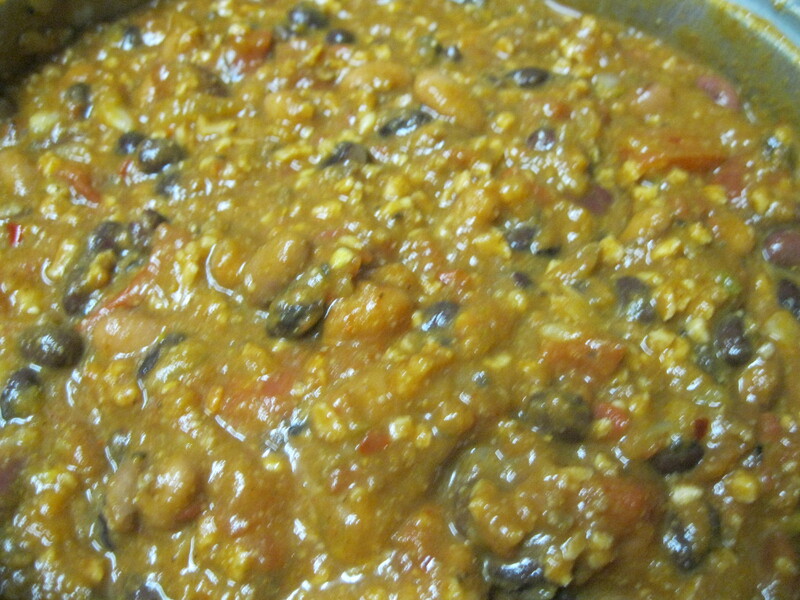 Crazy Easy Three Bean Chili and a Giveaway! Three bean vegan chili is nothing to sneeze at when we make it. 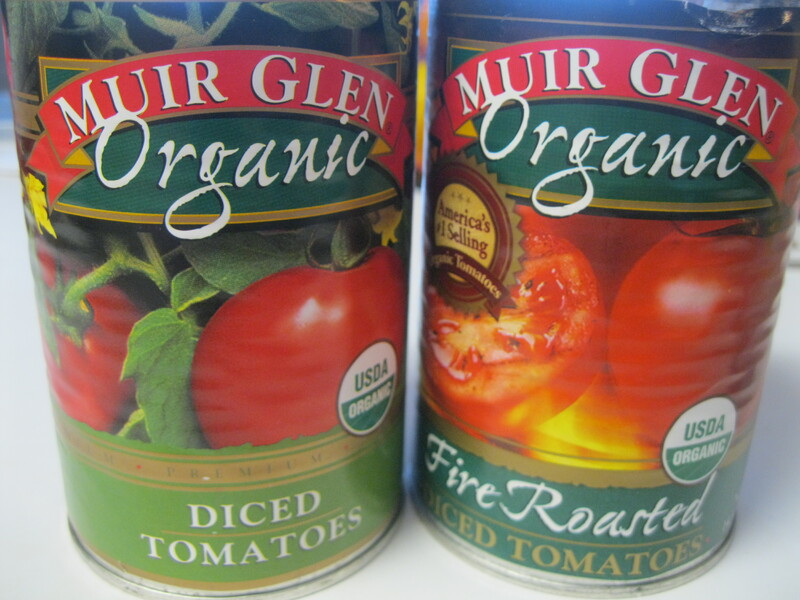 Before I talk about chili though, I’m going to tell you about Muir Glen – I’ve been using their organic canned tomatoes for years. I grew up farming and tomatoes have a special place in my heart. In fact I’m a tomato snob. I usually turn my nose up at tomatoes in the supermarket and in restaurants because they’ve lost their flavor through refrigeration, artificial ripening techniques, and through selective breeding for other traits like improved shelf life. 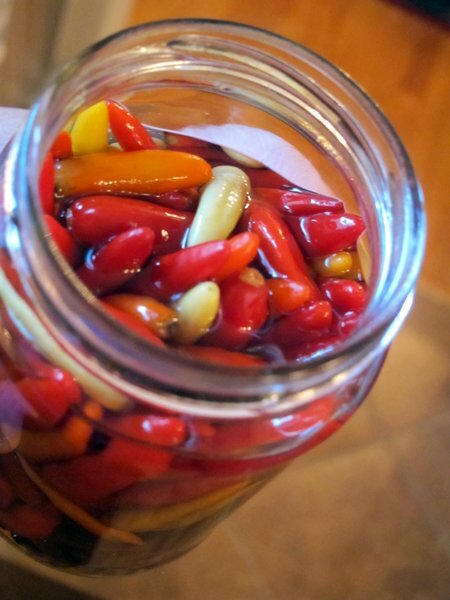 Subsequently I turn to canned varieties unless I can get good ones from my garden or from my farmer’s market. Muir Glen has a range of organic tomato products including their roasted diced tomatoes, tomato paste and regular diced tomatoes. Whatever they’re doing over there definitely makes a difference and this is a giveaway so you can see for yourself without spending your hard earned cash. 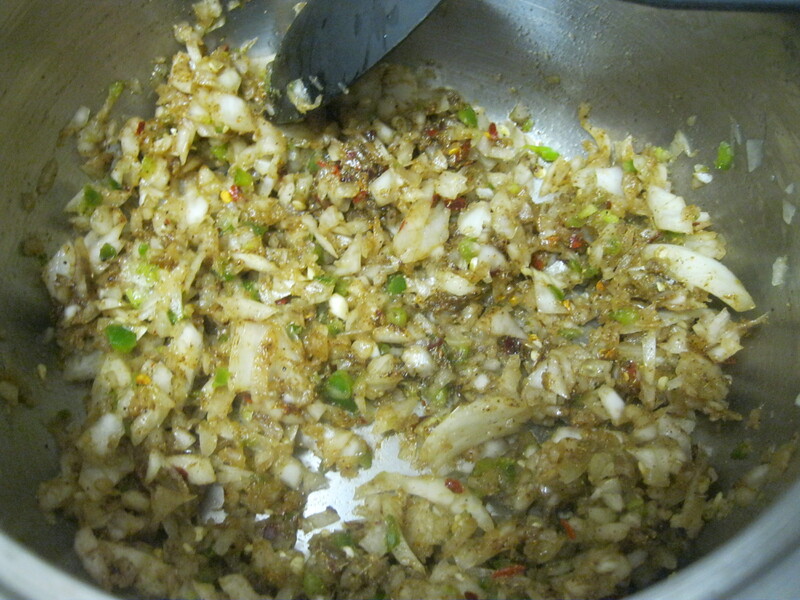 We sauteed the onion, jalapeño and spices and sauteed it in olive oil until the mixture was fragrant and steamy. Then we added the tomatoes and heated them until it started to bubble. 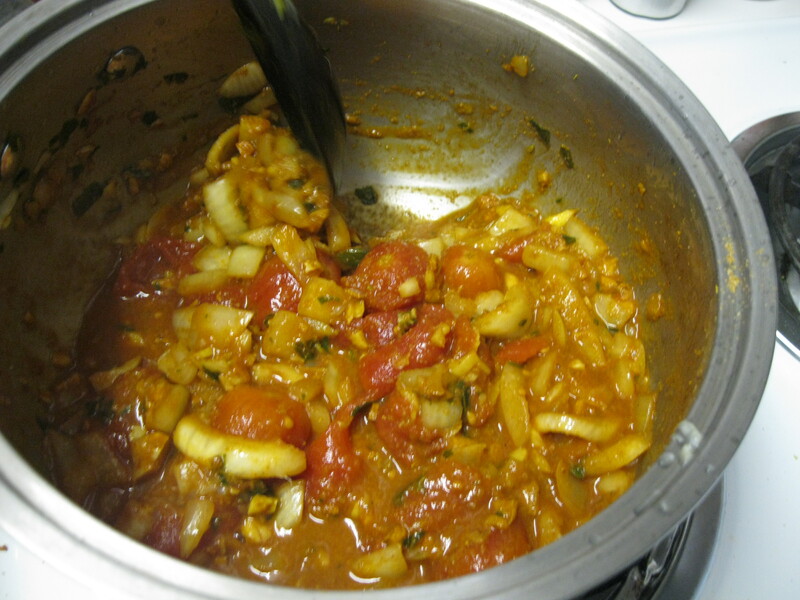 Then I added the rest of the ingredients (don’t drain the liquid from the beans or tomatoes). I added both TVP and pumpkin. That’s just how I roll. 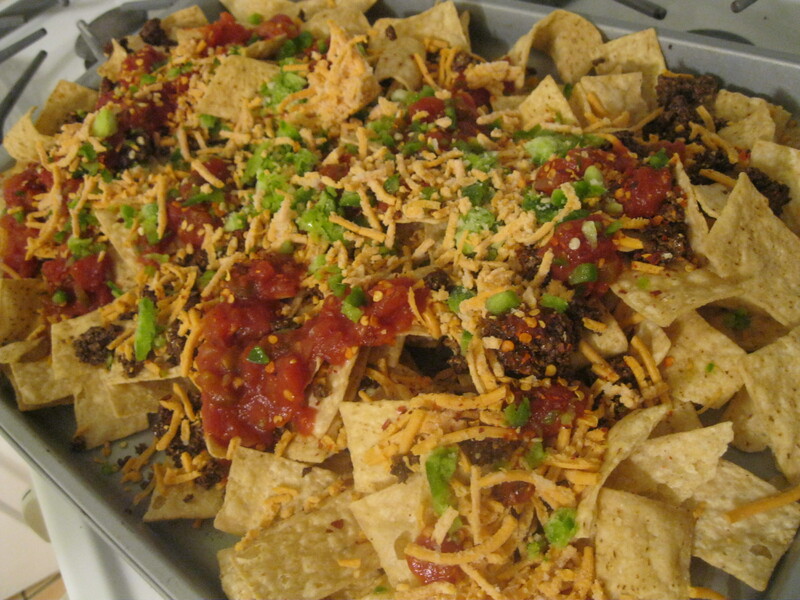 After it was nice and hot, I adjusted the spices and served up topped with Daiya and some home made bread. 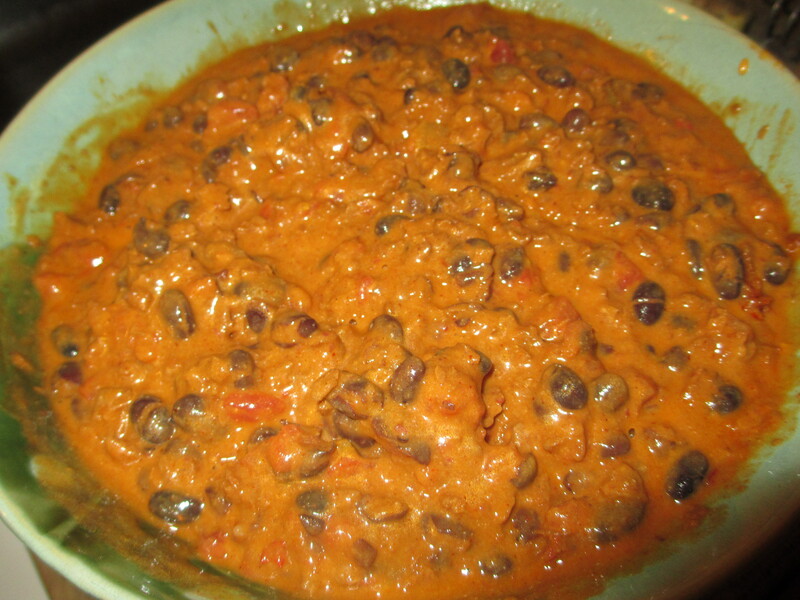 This is a flavorful chili that will fool a lot of meat eaters with how hearty it is. The roasted tomatoes add an additional depth of flavor that you can’t get just by adding liquid smoke. 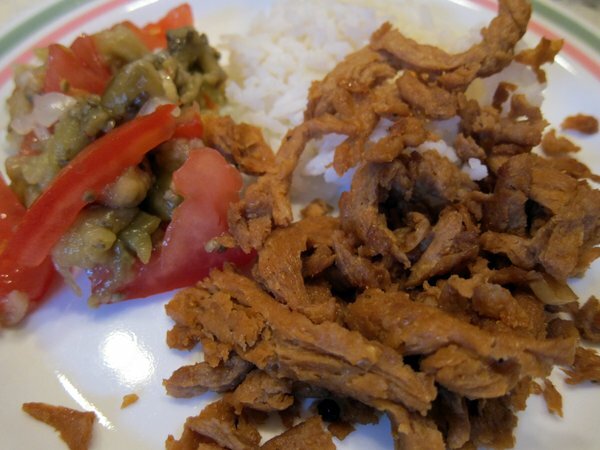 The textured vegetable protein will confuse a lot of vegans because it’s so meaty. It’s cholesterol-free, high in fiber and low in fat. So now on to the giveaway. This is a promo by Muir Glen: they’re going to send you a 14.5 oz can Reserve Harvest Sunset Organic Fire Roasted Diced Tomatoes, a 14.5 oz can Reserve Harvest Sunset Organic Diced Tomatoes, a 14.5 oz can Muir Glen Organic Fire Roasted Diced Tomatoes with Green Chilies, a 14.5 oz can Muir Glen Organic No-Salt Added Diced Tomatoes and recipe booklet featuring a variety of recipes created by award-winning chefs from around the country. Of course you’ll only need the recipe book for using the other cans of tomatoes because you’ll want 2 of them for my recipe. Then I’ll ask each of the randomly selected winners (5 in total) to email us their mailing address before midnight Sunday, October 14. I’m excited to pass on some free products that I’ve been enjoying for years so that I can be sure I’m not crazy for liking Muir Glen. 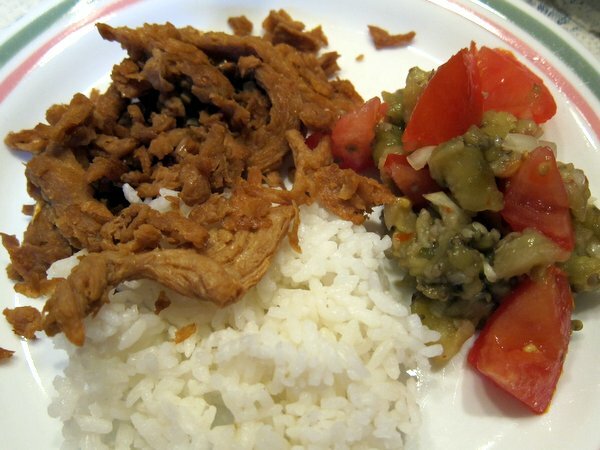 Adobo is a quintessential Filipino dish and cooking method. 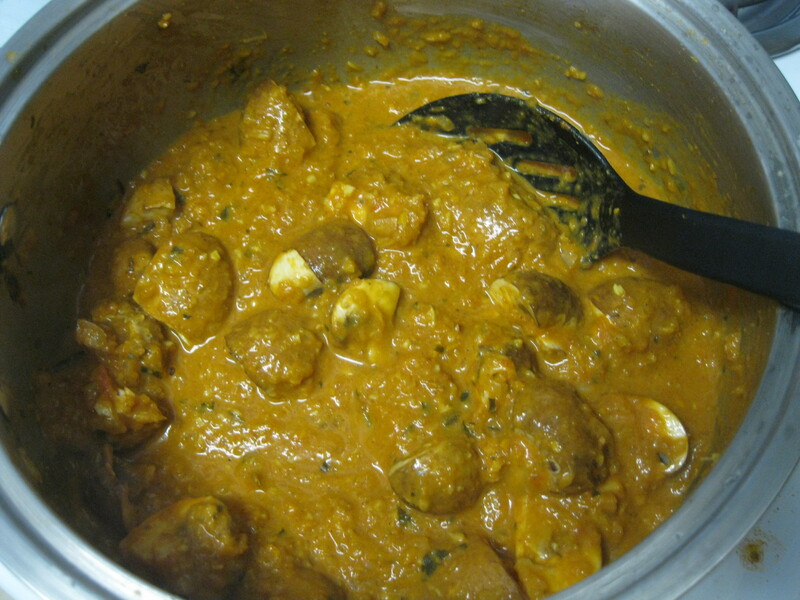 Pork or chicken are usually used, however, seafood and even vegetables can be cooked adobo-style. Clearly, soy curls are a great substitute. I’m still amazed by what a great meat substitute they are. 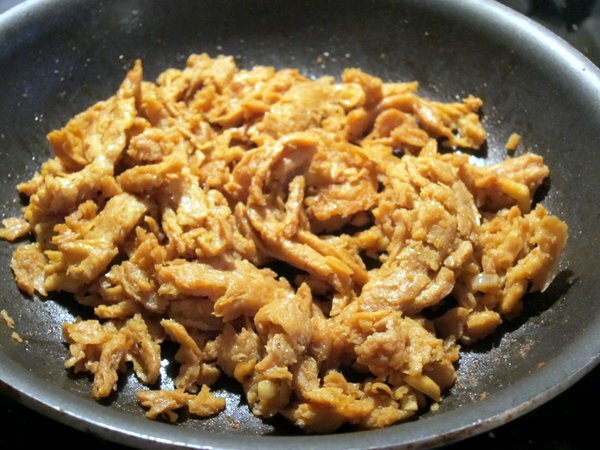 I’m also amazed that it took me so long to try making soy curl adobo because it’s so quick and easy. Special shout-out to my cousin Dulce for motivating me! I’m not listing measurements because all you need to know is this: use equal parts soy sauce and vinegar and use more if you want the adobo to be soupy and less if you don’t. The amount of garlic is your call, too, but adobo is meant to be garlicky. 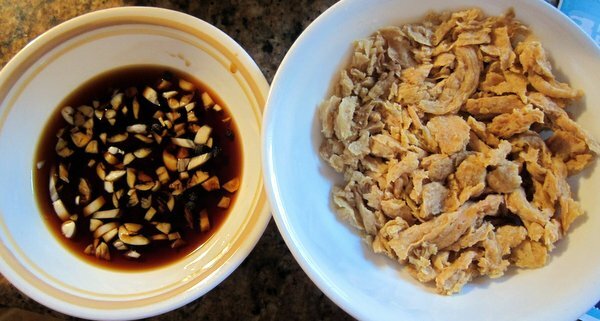 With about 1 cup of soy curls, I used 2 tbsp each of soy sauce and vinegar and two garlic cloves. I put the soy sauce, vinegar, garlic, and peppercorns in a small bowl (I didn’t have a bay leaf). 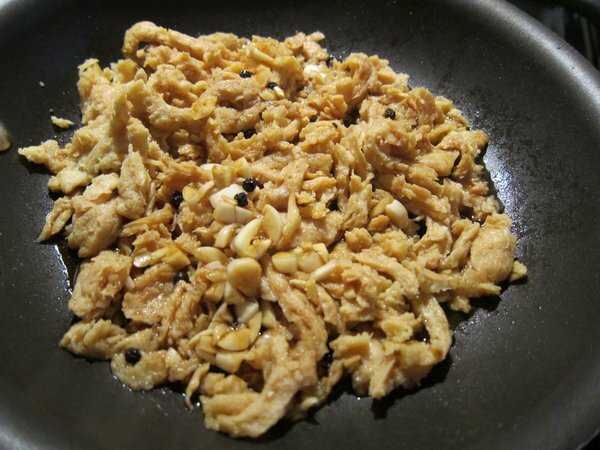 Then, I fired up a small frying pan (you can also use a saucepan or pot), heated some olive oil in it, threw in my rehydrated soy curls and some Chik-Style seasoning, and mixed it all together. Immediately after that, I added in the soy sauce-vinegar mixture. I mixed it again and let it cook. Optional: once the liquid starts cooling off a bit, you can add some turbinado (I did not). I didn’t use a lot of liquid, so I ended up with some dry adobo, which suits me just fine. 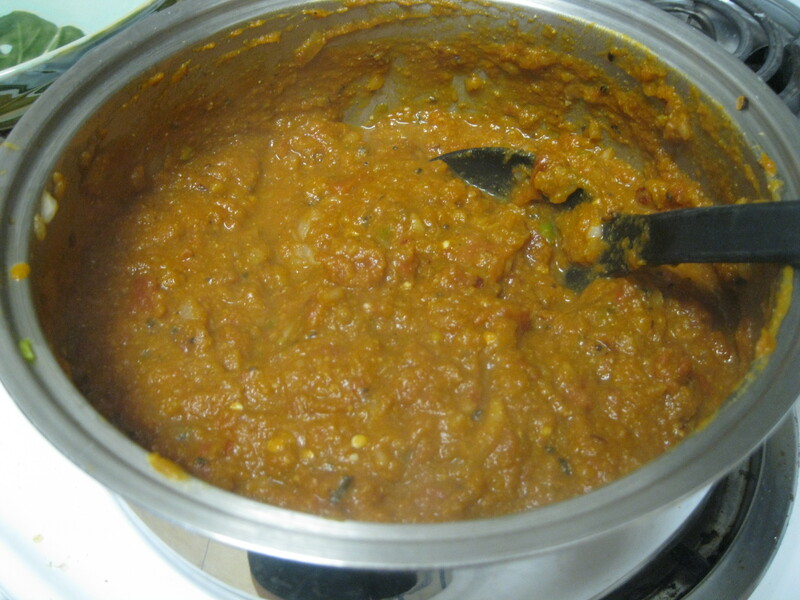 To accompany the adobo, I made an eggplant salad using one roasted eggplant, diced tomato, and minced shallot. 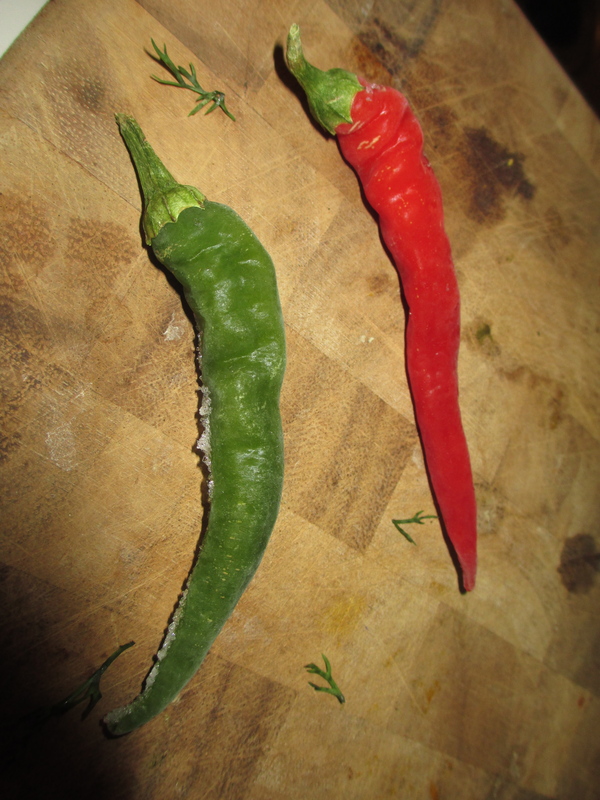 My dad pickles his pepper surplus, so I took one of these little chili peppers, minced it, and threw it in the salad along with some salt. 1 package water packed tofu, pressed and chopped into bite-sized chunks. Getting the ingredients together was the hardest part. Finding fresh curry leaves was a mission but we did… did you know they grow on trees? I didn’t know that before our quest for curry leaves. They’re pretty important for this dish so I recommend seeking them out. Add the tomato, 1/2 lime juice and cream cheese and mix. If you’ve got a hand blender, now is the time to use it. 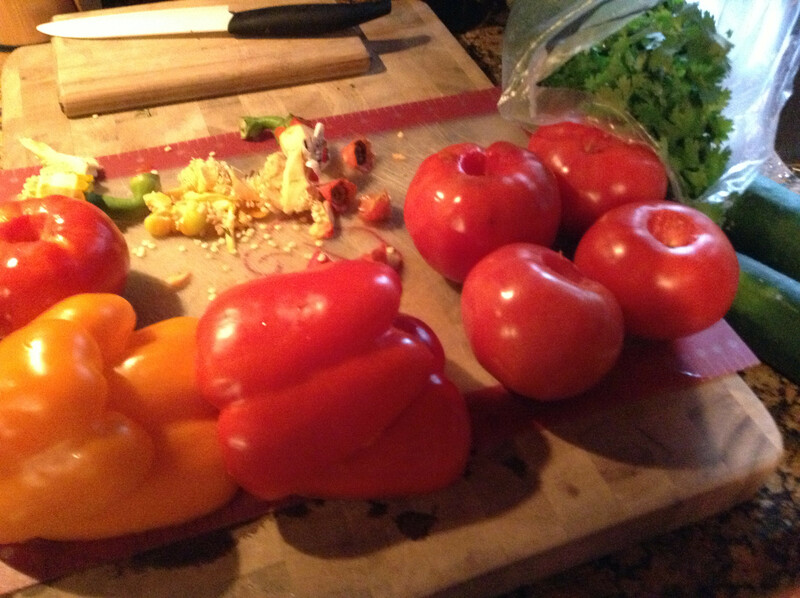 Otherwise, before the tomato gets too hot, put it all in your blender and mix until smooth. 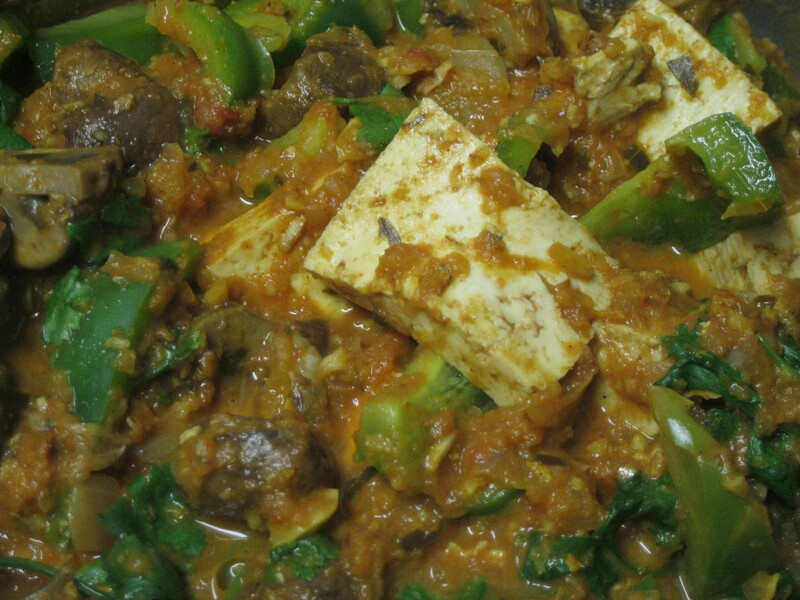 Add the tofu and mushrooms and allow to simmer for at least 45 minutes so the tofu takes on the flavors of the dish. 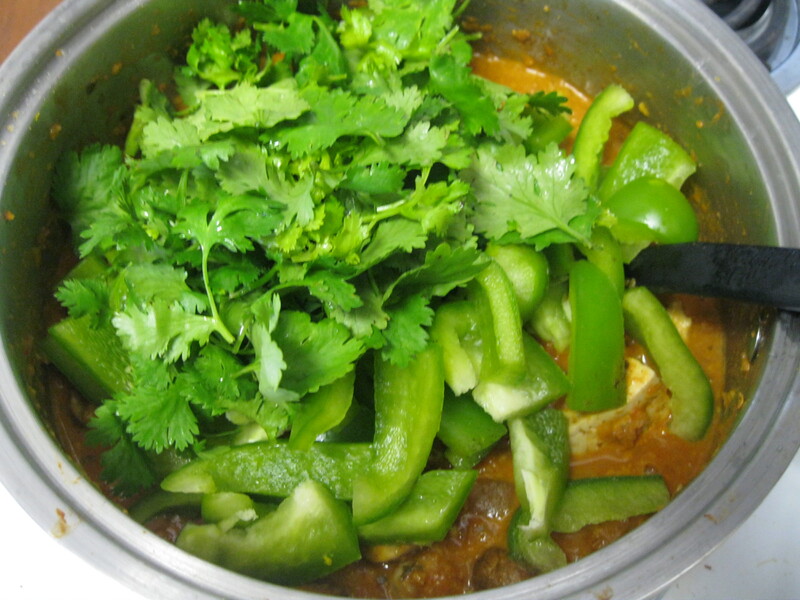 Stir in the green bell pepper and coriander 10 minutes before serving. So we served this with quinoa and red wine and it was not too far off from what I’ve had in restaurants: tart, creamy, herbal and rich. Did I mention I love Indian food? 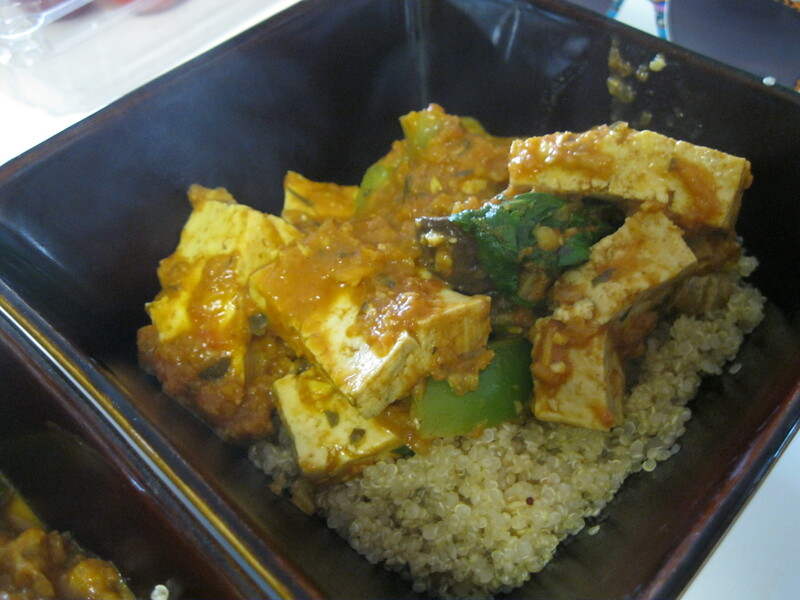 It was loaded with veggies, protein and exciting herbs. Even if it wasn’t authentic, it’s still delicious and good for you. We hope you get to try it.